When it comes to leadership, if I could only have one thing, it would be the trust of those I lead. Without trust, good leadership does not exist. While fear might force some to follow for a limited time, trust compels others to follow no matter the situation. Trust is what binds the relationship between leader and follower. Where trust is absent, so too is absent all the other qualities necessary for good leadership. 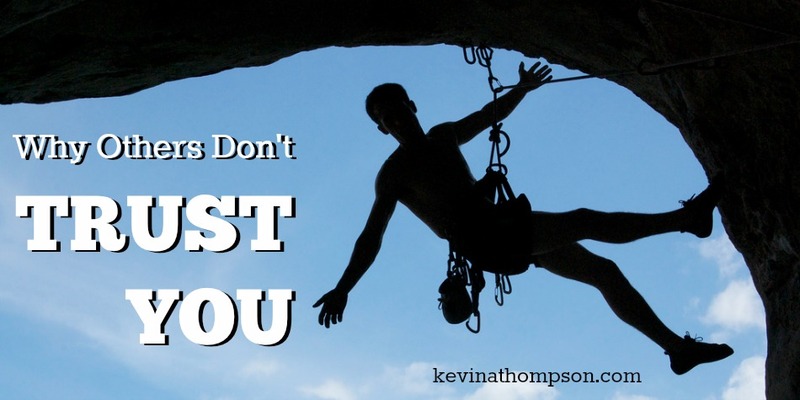 Without trust from others, we are not leaders. Trust, of course, requires trustworthiness. Wholeness. Leaders don’t have to be perfect, but they do need to be whole. This is an absence of personal conflict. When spoken words match unseen actions, a person is whole. There is no internal divide; no hypocrisy. Since we all have imperfections, the concept of wholeness is best seen when an inconsistency is revealed. Bad leaders make excuses, deny accusations, and cover-up inconsistencies. Bad leaders want the appearance of wholeness without actually having it. Good leaders change. When a character flaw or mistake is revealed, they are grateful for the revelation and do the hard work of making the necessary changes. They care more about the reality of internal wholeness than the appearance of it. When a leader is pursuing wholeness, they are often worth following. For trust to be exercised, a leader must take risks. We will never know if trust is present unless a risk is taken. A challenge must present itself and a leader must arise to meet the challenge. They call others out of apathy and into action. This is always risky. It’s easier to remain hidden, to stay enfolded within the group, to take cover in numbers. Yet a leader chooses a different direction. They are willing to separate themselves and individualize themselves all for the well-being of the group. Notice the inverse nature of leadership: a person who is thinking most about themselves and trying to protect themselves will stay hidden in a group while a person thinking most about a group and trying to protect the group may identify themselves individually in order to lead the group in the best direction. Of course this can also be done for selfish means. Just because someone tries to lead does not mean they are selfless in actions. Yet good leadership does require a submission of self for the well-being of others. Followers must take risks as well. Their risk is to follow the leader even without being certain the leader is right or completely trustworthy. There is always risk in following a person, idea, or belief. Since outcomes are unknown, following a leader is an act of faith. We trust that they are knowledgeable, good-hearted, and right even though we can never know that for sure. Following often means we are trusting others more than we trust ourselves. This requires great humility. The risk of following is one reason some leaders never truly lead. In spite of their personal integrity, track record of success, and conviction regarding the direction one should take, some leaders never lead because they refuse to follow. Their distrust in others becomes a hindrance for others to trust them. Few things cause us to distrust others as much as their unwillingness to trust us when we have earned it. Trust is often a reciprocal relationship—unless it is given, it cannot be received. This doesn’t mean we should blindly give trust in order to receive it. This does mean we must be willing to allow others to earn our trust even if we suffered in the past because others have abused the trust we gave them. Good leaders know it is risky to trust others. They have likely experienced the hurt when others do not prove themselves as trustworthy. Yet they also realize without trusting others, they themselves will not be trusted and leadership will not take place. Are you lacking in one of the four areas upon which trust is built—knowledge, courage, transparency, wholeness? If so, how can you grow in those areas? If not, is it possible others do not trust you because you do not trust them? Your distrust in them is causing them to show distrust in you. Trust is a foundational aspect of leadership. Small pieces of it can be given but most of it must be earned. A good leader is both trustworthy and trusting. Since you asked..,This article makes no sense to me. This coming from a pastor, I expected a mention of Jesus, or at the very least, one verse from the bible. But even if it is simply “self help” or some sort of “human resource” exercise from big corporation or government, my thoughts are the same. From the very start I lost interest because – “A leader is not “leading” people who don’t trust him or her.” Now within an organization, a leader may be acting like a leader (possibly even hired and labeled as a leader) and there be people near them (even working beside) but for him or her to assume you they are leading them is arrogant and unlike a true leader. Now I’m asking…”What do you think?” (serious discussion wanted as I am not attacking you personally and know you are a humble leader to those you lead.) Thank you. My website is not necessarily an extension of my preaching ministry so not every article includes a verse or a specific mention of Jesus. I think there is a typo in the next to last sentence so I’m having difficulty understanding your question. Could you reword it and ask it again? Absolutely. Leadership is a word we use to mean so many different things. Even in my article I probably used it several ways. I wrote with the intent of writing about good leadership which has nothing to do with title or position. I think you are exactly right.